Startup ideas can come from anywhere! Currently unemployed, previously Co-founder of CoCubes - Harpreet Singh Grover is in conversation with hosts Shiladitya and Amit about his journey from starting CoCubes to selling the venture to Aon Hewitt. Find out all about his experiences and the challenges he faced in the startup space. Tweet to Harpreet @hsgrover, Shiladitya @shiladitya and Amit @doshiamit for your questions or reactions to this episode! Shunya One, IVM Podcasts, IVM, Tech, Startup, CoCubes, Aon Hewitt, Entrepreneur, EdTech, Education, College, Companies, Market Size. Co-founder & CEO of Remitr, Kanchan Kumar is in conversation with hosts Shiladitya and Amit about his cross border payment platform Remitr and how the complex and costly process of international payments and remittances are made simple with the help of technology. Tweet to Kanchan @kanchankumar, Shiladitya @shiladitya and Amit @doshiamit for your questions or reactions to this episode! How much do you know about Plant and Cell based meat ? This week on Shunya One we have the Managing Director India for The Good Food Institute - Varun Deshpande in conversation with hosts Shiladitya and Amit where they talk about the Institute and it's vision for the Indian market. They cover various aspects of food tech innovations and it's impact across the globe. Tweet to Varun @varund7, Shiladitya @shiladitya and Amit @doshiamit for your questions or reactions to this episode! hosts Shiladitya and Amit about his latest vernacular gaming platform Loco and the game mechanics that goes into it. The conversation spans from augmented and virtual reality to Loco serving as 'One Stop Entertainment Destination' for its users. Tweet to Shiladitya @shiladitya and Amit @doshiamit for your questions or reactions to this episode! On this week's episode, Chiragh Kirpalani, founder of Ayopop is in conversation with host Shiladitya to talk about his startup venture and the difference between Indian and Jakarta startup culture. He talks about his perspective towards the market and how to move forward effectively. Tweet to Chiragh @cKirpalani, Shiladitya @shiladitya and Amit @doshiamit for your questions or reactions to this episode! Gaurav Munjal, Co-founder and CEO of Unacademy joins hosts Shiladitya and Amit to talk about his love for coding to starting his own Youtube channel to finally building Unacademy which is India's largest learning platform. Tweet to Gaurav @gauravmunjal, Shiladitya @shiladitya and Amit @doshiamitfor your questions or reactions to this episode! Tweet to Abhishek @AbhishekMadhavn, Shiladitya @shiladitya and Amit @doshiamit for your questions or reactions to this episode! What are the Indian companies that are doing well in Sweden? Secretary-General & President at Sweden-India Business Council Robin Sukhia joins hosts to talk about the future and growth of Indo-Swedish business relationship. Tweet to Robin @RobinSukhia or to Sweden-India Business Council @SIBCtweets, @Shiladitya @shiladitya and Amit @doshiamit for your questions or reactions to this episode! 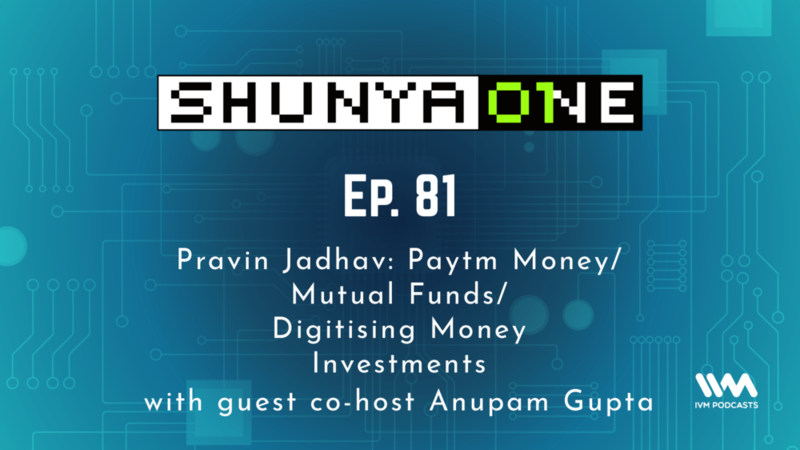 Paytm money whole-time director Pravin Jadhav joins hosts Amit and Shiladitya to talk about his journey from business school to establishing Paytm money. They talk about the initial challenges faced by the company during the setting up of the app. Tweet to Pravin @BeingPractical, Shiladitya @shiladitya and Amit @doshiamitfor your questions or reactions to this episode! This week we're rebroadcast episode 40 where we are joined by Nischal Shetty, Founder, WazirX - a cryptocurrency exchange platform. He is also the founder of Crowdfire, since 2010. Crowdfire helps bloggers, YouTubers, e-sellers grow and build their brand. This conversation focuses on bitcoin, crypto assets, and blockchain. Tweet to Nischal @NischalShetty, Shiladitya @shiladitya and Amit @doshiamitfor your questions or reactions to this episode! 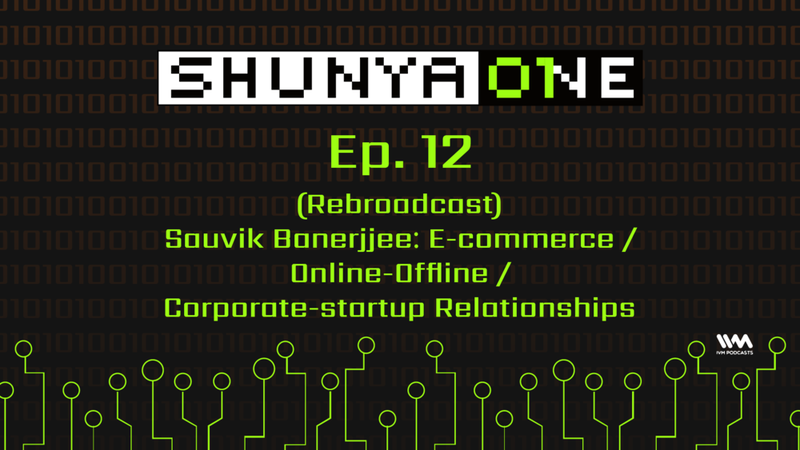 On this rebroadcast episode of Shunya One, we are joined by Ankush Sachdeva, CEO/Co-founder at ShareChat (https://www.sharechat.com), a content-sharing social networking platform essentially for regional languages and emerging markets. Tweet to Ankush @AnkushSach, Shiladitya @shiladitya and Amit @doshiamitfor your questions or reactions to this episode! This week we are rebroadcasting episode 32, where hosts Amit Doshi and Shiladitya are joined by Anuj Tandon, CEO at Yoozoo Games India. This conversation covers the Indian gaming market, its business model and the technology used for different gaming platforms. This week on Shunya One rebroadcasting, we are joined by Aseem Khare, CEO at Adonis Electronics. This conversation is focused on the rise and fall of the Powai startup ecosystem, the home services sector in India and the process of shutting down startups. Tweet to Aseem @aseemkhare, Shiladitya @shiladitya and Amit @doshiamitfor your questions or reactions to this episode! On this episode of Shunya One, we're rebroadcasting an episode from the archives, where hosts Shiladitya and Amit are joined by Zishaan Hayath, Co-founder, Toppr.com. The conversation covers the startup ecosystem in Powai, challenges of angel investing and technology in the education sector. Tweet to Zishaan @Zishaan, Shiladitya @shiladitya and Amit @doshiamit for your questions or reactions to this episode! 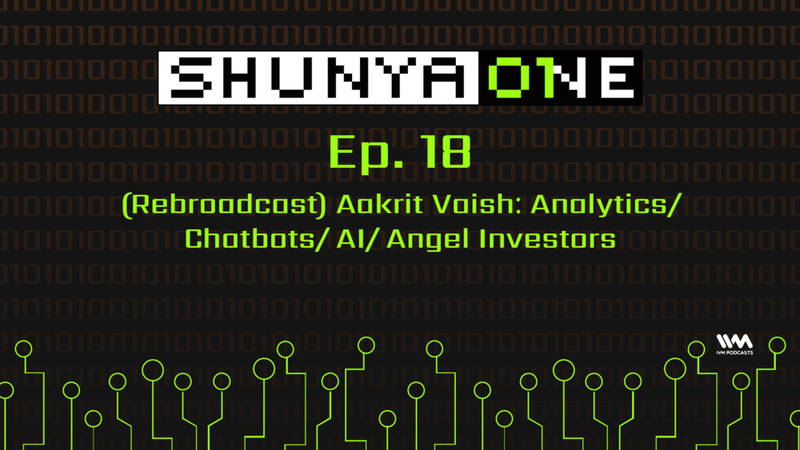 This week on Shunya One, we're rebroadcasting episode 18 where hosts Shiladitya and Amit talk to Aakrit Vaish, Co-founder, and CEO of Haptik.Inc (http://haptik.ai/). The conversation covers his time as Director of Global Business Operations and India at Flurry Inc, starting Haptik, breaking down analytics, artificial intelligence and more. Tweet to Aakrit @aakuvaish, Shiladitya @shiladitya and Amit @doshiamit for your questions or reactions to this episode! On this episode of Shunya One, we're rebroadcasting an episode from the archives, where hosts Shiladitya and Amit are joined by Amrut Dhumal, Co-founder at Mindseed to talk about rethinking the current education system, how technology and education can redefine the way we look at academics and the path ahead. Tweet to Amrut @AmrutDhumal, Shiladitya @shiladitya and Amit @doshiamitfor your questions or reactions to this episode! On this episode of Shunya One, we're rebroadcasting an episode from the archives, where hosts Shiladitya and Amit are joined by Miten Sampat, who leads Corporate Development for Times Internet Ltd. The show brings you a conversation covering corporate development investing, the scale of data security in the country, and technology operations in India versus Silicon Valley. Tweet to Miten @miten, Shiladitya @shiladitya and Amit @doshiamit for your questions or reactions to this episode! This week on Shunya One, we're rebroadcasting episode 12 where Shiladitya and Amit discuss the new transition in corporate-startup relationships and brand technologies behind the Indian e-commerce market with Vice-President of Digital Tata Industries and CTO of Tata CliQ, Sauvik Banerjjee. Tweet to Sauvik @sovs76, Shiladitya @shiladitya and Amit @doshiamit for your questions or reactions to this episode!